Vladimir Gitlevich is a software architect in San Francisco. He has been developing software for over two decades. For several years he was a part of Domain Language, where he consulted on a number of projects as a design mentor. 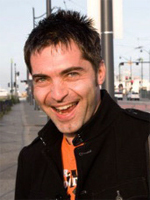 Vladimir is the site’s editor and webmaster. He’s also the founder of DDD-NYC SIG. many different approaches and many different outcomes.Eric now leads Domain Language, a consulting group which coaches and trains teams applying domain-driven design, helping them to make their development work more productive and more valuable to their business.